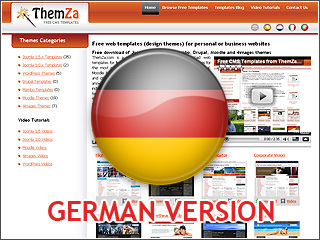 For all of our visitors from Germany, we have good news – Themza.com is translated into German! Now, you can visit our Kostenlose Themen section and browse the free themes available there in your native language. To access the German version, simply click on the small German flag in the navigation menu, or visit our website with appended /de at the end – themza.com/de. You can browse the free templates by their categories, located in the left sidebar – Joomla 1.0, Joomla 1.5, WordPress, Moodle and 4images . Each template is presented by a detailed article, explaining the template’s features and for what types of websites it’s suitable for. Video-Lektionen are available with each template to show you its supported features and customization options. And for the latest news about our free templates, you can always follow our Design Blog. This entry was posted on Friday, December 18th, 2009 at 8:00 am	and is filed under General updates. You can follow any responses to this entry through the RSS 2.0 feed. You can leave a response, or trackback from your own site.